Wilshaw’s “Block of Wood” Moment? Old Andrew draws our attention to an apparent turnaround in the Ofsted framework which make them less judgemental of traditional, didactic teaching techniques. Inspectors must not give the impression that Ofsted favours a particular teaching style. Moreover, they must not inspect or report in a way that is not stipulated in the framework, handbook or guidance. For example, they should not criticise teacher talk for being overlong or bemoan a lack of opportunity for different activities in lessons unless there is unequivocal evidence that this is slowing learning over time. I have mixed feelings about Sir Michael Wilshaw, the instigator of this change. On the one hand, I have been dismayed with comments like “if anyone says to you that ‘staff morale is at an all-time low’ you will know you are doing something right.” . On the other, in some speeches it seemed that he was attempting to address the dead hand of trendy “group-work-good, teacher-talk-bad” Ofsted orthodoxy. In a previous post, I likened Wilshaw to the captain of a supertanker, and asked whether he would be able to rein in the “talk-less-teaching” rottweilers on his staff. Large organisations can have a momentum as stubborn as supertanker and plough onwards in the same direction for mile after mile, whatever the frantic signals from the wheelhouse say. In this latest iteration of the ever-changing whirligig that is the Ofsted inspection framework, Wilshaw appears to have nailed his colours to the mast. Rather than “T” for “Trendy” it seems that he is flying the “P” for “Pragmatic” flag — anything goes, as long as it works. Could this be the defining moment for Wilshaw? Possibly, it could be his “block of wood” moment. Knowing also that the severities of the past had earned him a certain amount of hatred, to purge the minds of the people and to win them over completely he determined to show that if cruelties had been inflicted they were not his doing but prompted by the harsh nature of his minister. …. [T]hen, one morning, [the minister’s] body was found cut in two pieces on the piazza at Cesena, with a block of wood and a bloody knife beside it. The brutality of this spectacle kept the people of the Romagna for a time appeased and stupefied. The reference is to a story about Cesare Borgia and how he calmed a turbulent province by appointing a “cruel and unscrupulous man” to rule as his minister. When the man’s severe methods had secured a measure of peace and calm to the territory, Cesare Borgia dispensed with his services in the very final and bloody way outlined above. Just to be clear, I am likening Wilshaw to Borgia and saying that he has, essentially, dispensed with the services of the previous “cruel and unscrupulous” style of Ofsted framework in a very public way. OK, so it’s by way of pressing the delete key on a keyboard rather than a bloody knife, but I hope you get my drift. And so is the teaching profession “appeased and stupefied” by Wilshaw’s action? A little bit, perhaps. For my part, I will wait and see what effect this has on the next round of inspection reports and (perhaps more importantly) internal school observation criteria before I celebrate, but I am, I must confess, faintly encouraged. And on that cheerful note: Happy New Year! George Eliot (penname of Mary Anne Evans, 1819-1880): did she predict the rise of the Internet? In fact, the evident tendency of things to contract personal communication within the narrowest limits makes us tremble lest some further development of the electric telegraph should reduce us to a society of mutes, or to a sort of insects communicating by ingenious antenna of our own invention. The internet is a further development of the electric telegraph. Mobile phone technology can certainly be likened to “ingenious antenna of our own invention”. Perhaps we will grow more insect-like as we incorporate the technology more and more into our physical structure. I suspect that “Google Glass” is only the beginning of the process. 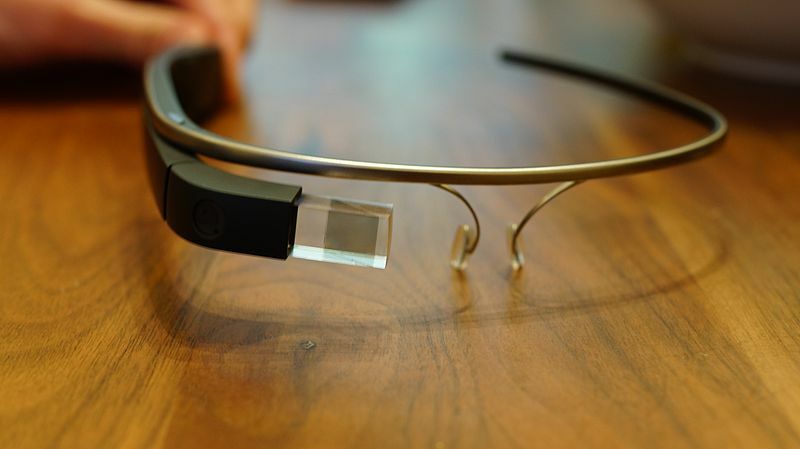 Google Glass is a wearable computer with an optical head-mounted display (OHMD) that is being developed by Google in the Project Glass research and development project. (Wikipedia). But is this and similar technology in the process of reducing us to a society of mutes? Yes and no. In my experience, digital communication can certainly help to spark conversation of the old-fashioned, face-to-face kind. However, as my wife has frequently observed–acerbically, but with love, as only she can(! )–I am all too ready to crawl into my digital man-cave of an evening. I can’t help but be aware that I am also one of those people who often prefers to email or text rather than make an actual person-to-person phone call. And how does being a blog-writer fit into this pattern? Pass over those electronic antenna of our own invention, Alice. I don’t think that I’m a particularly unsociable person, but it makes me think. Selective verbal mutism: is this the wave of the future? Not with a bang but a Tweet. And a Merry Christmas to one and all! A Slice of Humble PISA: Back to Basics For Us All…? Over a period of two or three years the scholarship boys were crammed with learning as cynically as a goose is crammed for Christmas. And with what learning! . . . At St Cyprian’s the whole process was frankly a preparation for a sort of confidence trick. Your job was to learn exactly those things that would give an examiner the impression that you knew more than you did know, and as far as possible to avoid burdening your brain with anything else. Perhaps enough ink and bile have been spilled and projected over the recent PISA ranking that you may feel that no more needs to be said. Perhaps you are correct. However, this post is only tangentially addressed towards this. In this post, I want to mention a nagging worry that has been growing in my mind for a number of years concerning science education in the UK. The feeling I have is that we are not getting the fundamental basics of science education correct. At times, I feel that we are inflicting a St Cyprian-style (so memorably described by George Orwell in the quote above) of science education on the majority of students. Now, I am not approaching this from the angle of “things-were-so-much-better-in-the-old-days-before-all-this-grade-inflation-malarkey”. Rather, I am going to lay out some items of concern that I have. Item the first: I was recently reminded of an old (1984) textbook called A First Physics Course by R. B. Arnold. I remember I had a class set of these in my very first classroom. It was written as a guide for Y7-9 students and was crammed full of neat experiments. For example, the section on magnetism showed how to magnetise a needle to make a compass (not as easy as you might think — how can you make sure the north seeking pole is at the pointy end?) and then a bunch of other enjoyable experiments (well, I enjoyed them anyway). Item the second: look up the word density in the Collins scheme, or most other KS3 schemes for that matter and you get . . . zilch, zero, nada, nothing. This is sad, because I think the concept of density is an excellent example of how we can process physical measurements to get a surprisingly useful quantity. The class measures the mass of 100 cubic centimetres of water and then divide the mass by the volume to find the density, the mass per cubic centimetre. Big deal. What can they do with that? The answer — everything. Can we weigh the world’s oceans? Sure, if we know the volume: mass = density x volume. Can we estimate the mass of a human head (preferably without removing it from its owner)? Sure: find the mass of a human being (easy) and the volume (tricky but not impossible), calculate the average density of a human being, then measure the volume of the head (again tricky but can be done with a bucket of water, a towel and a show-off volunteer) and use the mass = density x volume equation. Students get concrete, real world experience of mathematical manipulation of a quantity that can be felt (compare the weight of 1 cubic centimetre of lead with 1 cubic centimetre of wood) and yet is essentially an abstract quantity: a window on a wider world, so to speak. Who could ask for anything more? Item the third: someone, somewhere who really, truly should know better thinks that the art of precise measurement is trivial. To the best of my knowledge, there is no KS3 or KS4 course that currently gives this noble but neglected skill its due acknowledgement. I despair of A-level students who cannot use a metre rule to produce simple readings of length of sufficient precision without intensive coaching. (“Avoid parallax error, read to the nearest millimetre, not the nearest cm” and so on). It’s also quite a laugh watching students use measuring cylinders too — although if you want a real belly laugh try asking them to adjust a simple laboratory stand and clamp: generally speaking, students will tighten and loosen the screws at random. Digital natives? Perhaps. Mechanical idiots? Definitely. I suspect that at the root of it is the British class system: the thinkers are generally regarded as superior to the do-ers, and all too often practical skills are classified as ‘merely’ mechanical and menial, and not worthy of the attention of a true professional. To learn a mystic formula for answering questions is very bad. The book has some others: “gravity makes it fall;” “the soles of your shoes wear out because of friction.” Shoe leather wears out because it rubs against the sidewalk and the little notches and bumps on the sidewalk grab pieces and pull them off. To simply say it is because of friction, is sad, because it’s not science.